So, at this YouTube link around the 32:15 mark comes a version of "Carol of the Bells" that's mostly orchestral with a female chorus. If I were to hazard a guess I would say it was recorded in the '70s or possibly the late '60s. I was wondering if anyone here might be able to identify the artist for me? 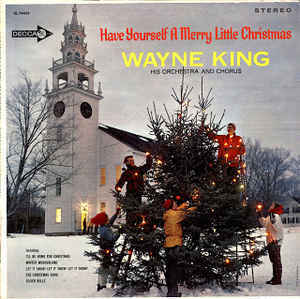 Wayne King and his Orchestra from the 1963 LP "Have Yourself A Merry Christmas". This splendid album resides in the 1st Tier of my Top 500, coming in at #101. It's one of the albums that I'm working to get released on CD for the first time. But since UMG's nascent cooperation seems to have faded, it will unfortunately now be exponentially more difficult. It was one of the first albums I transferred from vinyl to MP3 back in the early days. At that point I had the mono version. I have since acquired the stereo version, which adds so much more dimension to the arrangements. Absolutely; stereo is a must on this one. Thanks for the reply, Your Majesty!